Immaculately restored 2 bedroom villa with private covered patio and use of the pool. Historical Pistoia within 15min drive and only 50min to the sandy beaches of Versilia. This newly renovated barn has been furnished and decorated with great character. Friendly and unintrusive owners live few hundred meters away are available in case of need. The property is located in a strategic location to visit Florence by car or train in less than 1 hour. The beaches in Forte dei Marmi and Viareggio are less than 1 hour away by car or train. Lesser known Pistoia, Prato, Vinci are only few towns worth visiting and away from the mass tourism. The peaks of Abetone are also a locals' favourites destination both in winter and summer. For those seeking a peaceful location, the villa is a perfect retreat without compromise on practicality to get into town. Quarrata is only 5 min drive down the road, with its pretty historical centre full of character and away from mass tourism. Must see places in the area are the hidden jewels of Pistoia and Montecatini Terme located within 30min drive. 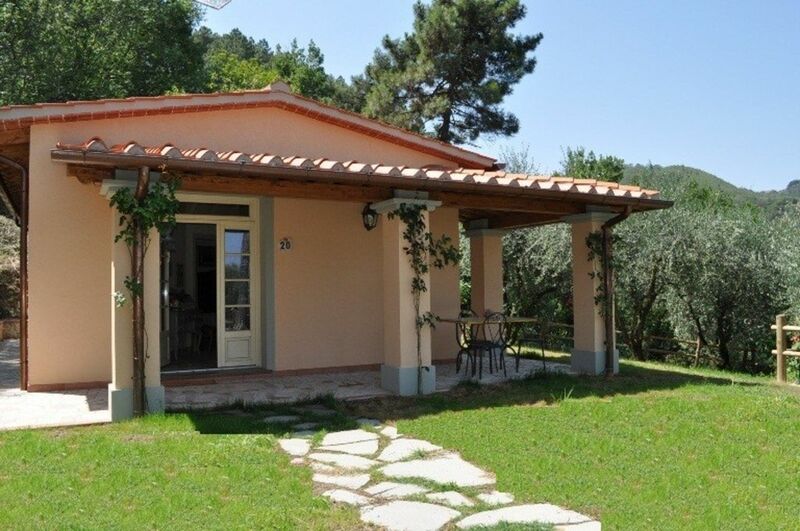 Lucca is a must in your exploring plans at this property. The villa is located on a high location assuring guests with a constantly mild temperature even in peak season. However the villa is fully air conditioned in case you find Italian summers too warm for you. This charming villa is all on ground floor with entrance through its shady verandah equipped with outdoor furniture. Homely touches and pastel colours will make the first impression. The open plan kitchen/dining room enjoys plenty of natural light. The kitchen has a 2 ring cooker and a small fridge with freezer compartment. In the villa there is a washing machine and an electric grill. There is a good size double bedroom with access to the garden and private bathroom with shower. The second bedroom is a little smaller with 2 single beds that can become double on request. Both bedrooms benefit of a TV SAT with many foreign channels. There is an additional bathroom with beautiful tiles and a large shower. The amicable owners which speaks a fluent English (Basic French speaking) occasionally and discreetly use the pool which measures 6m x 12m and is 1.5m deep all the way. The pool is located 100meters away and is accessed by a walkway (more practical when using a pushchair) or 10 steps stairway with handrail. The area around the pool is immaculately kept and surrounded by lush vegetation over which there is a fantastic view of the valley. The owners are keen on sharing their hearty produces of the season such as tomatoes and other vegetables that can be found on the way to the pool. On a side of the pool you will find a shaded area with table and chairs and a built in barbecue where to enjoy an outdoor meal. Amenities include an internet key to plug into your portable computer. It works on a pay as you go credit that has to be replenished by the client (the owner will help you do this). The amicable owners occasionally and discreetly use the pool which measures 6m x 12m and is 1.5m deep all the way. But usually they do not use it when the villa is rented. The villa is all on ground floor so guests with walking difficulties can be comfortable here. The way to the pool is gravel therefire a wheelchair user will find it uncomfortable. Lovely villa up in the mountains, beautiful views, great for a rural retreat! Consuelo was an amazing host, so welcoming & accommodating! Villa had everything you needed, the pool was perfect for relaxing days! Location was good for touring Tuscany, highly recommend, will definitely stay here again if we return to Tuscany. The villa is lovely, the facilities are superb (especially the pool!) and the website description sells it short in every respect. The owner is very kind and helpful and gave us local produce on arrival and even cake. The accommodation and location exceeded our expectations in every way and I cannot recommend it highly enough. this place is so well constructed and expertly decorated. Truly an Italian home with all the comforts you need. It is small in that it doesn't have a den but the outdoor area makes up for it. The pool and surrounding area were very relaxing. Consuela, the owner, was so pleasant and accommodating on our visit. She made the stay so enjoyable by her pleasant attitude about everything. it is close to many popular places to see in Italy including Florence and Tuscany and the coast. What a lovely time we had. Thanks, Consuela!!!!!!!! Looking for a holiday out in the countryside in comfort and peace? - then this is for you. Previous reviews give this villa five stars and so do I and my family. Consuelo, the owner, lives in a house some 70 metres away with her extended family; she is there when you need her with advice or suggestions but is never intrusive. We were greeted with a welcoming smile and a bottle of their own wine, some of the family's olive oil, courgettes, tomatoes and peaches from the garden. The villa is clean, well appointed and relaxing; beds are comfortable, the bathrooms and kitchen spotless and everything that you need is to hand. There is WiFi and excellent air-conditioning. The pool is wonderful with towels provided for the house and pool area. There are facilities for a BBQ, if needed, at the house and down at the pool (a 3 min walk from the house). Ample seating, loungers and tables are provided but the secret of Villa le Rose's comfort and success is found in the care that Consuelo and family have given the house and their welcome to it. The villa is in a peaceful, private spot; the road to the property is a bit steep and narrow but after negotiating it the first time, it is then no bother thereafter. The surrounding area is delightful; Pistoia is not generally a tourist destination but the centre is ancient and charming with many good restaurants. We thoroughly enjoyed our stay - and wished it had been longer. The house is a delight and Consuelo and family wonderful - they are now our friends. The Williams family. Beautiful villa with lovely furnishings and surroundings. We had a wonderful stay in this villa with superb hosts who spoke excellent English. The house was in a lovely spot half way up a hillside and away from the owners house. The swimming pool area is fantastic with lots of seating and shade and we always had it to ourselves. Perfect for those looking for peace and quiet, but supermarkets were easily accessible and Lucca and Florence were not far away. I cannot recommend this villa enough, mainly because it is beautifully presented in every way and the owners were extremely helpful and friendly! My husband and I stayed in this delightful villa for our honeymoon. The tranquility of the surroundings made this the perfect place to unwind after a very busy year. The villa itself is beautifully maintained and has a wonderful rustic charm. It location is perfect for a exploring Northern Tuscany, we loved the villa and we loved Tuscany. The property is ideal for guests seeking a safe, tranquil setting as well as a good location to explore major places by car or train Florence (1hr), Lucca (30mn), beaches (40mn), Montecatini spa baths (30mn), Pisa (50mn) and many many more.. Location is particularly indicated for families as temperature is milder on the hill where the villa is located. Also it is strikingly easy to get to the sandy beaches in Versilia as well as to the beautiful peaks of Abetone which is a lovely destination for summer too! Pistoia (10mn) and Quarrata (5mn) are the nearest towns worth a visit and in summer they are animated by street markets and concerts. In August is quieter but still plenty to do or simply relax by the beautiful large pool!